Janakalyan is a team of dedicated professionals committed towards empowerment of underprivileged in the Society. All programmes are focused on natural resources such as land, water, crops, livestock, vegetation etc. with human beings in the centre, and are implemented through the medium of Self Help Groups (SHGs). The ethos is holistic development of community by nurturing four holy mothers namely Manavi Mata (Women), Bhoo Mata (Soil), Go Mata (Animals), and Ganga Mata (Water). The migration of refugees, mostly Hindu Bengalis to India after partition, and their rehabilitation, under Sindhanur Rehabilitation Project in the Raichur district of Karnataka, led to the establishment of Janakalyan. It was formed to help resolve issues related to soil degradation, low agricultural productivity, lack of connectivity with markets, costly inputs and credits etc. faced by migrants and to enable them to survive and generate income. Starting with four rehabilitation colonies in Sindhanur, Janakalyan today has managed to reach out to more than 1,000 villages across Karnataka. Though the organisation has a history of 25 long years in the development sector in the remote parts of northern Karnataka, it was formally registered as a Society in 1997. Janakalyan completed fifteen years in 2012 and celebrated it meaningfully as ‘Child Care Year’ by identifying and supporting 200 children for health and education. As one of the oldest NGOs in Raichur district of Karnataka, Janakalyan acts as a watchdog and considers itself as an assisting agency for the government. It facilitates government schemes such as NREGA, Suvarna Gramodaya, etc. in the area of its operations. It has taken up various innovative projects in collaboration with UNICEF, NABARD, World Bank, SRTT etc. Janakalyan restricts itself to work for rural communities to reduce the gap between India (urban India) and Bharat (rural India). 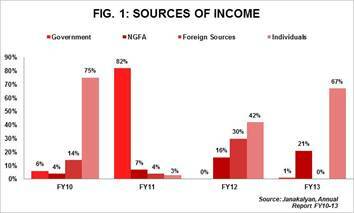 Income: Posted an income of Rs11.7mn in FY13 as against Rs9mn in FY12, with substantial contribution by individuals (67%) and Non-Government Funding Agencies – (NGFAs, 21%). Janakalyan has sourced funds from diverse segments over past three years instead of placing reliance on a single source of funding. The Y-o-Y receipt of funds from different sources is inconsistent on account of unutilised grants of the previous years accounted for in the subsequent financial year. Janakalyan is supported by agencies such as NABARD, Tata Trusts, and Infosys etc. in its initiatives. (Refer Fig 1). Beneficiary fees: About 9% (Rs1mn) of total income in FY13 was collected from farmers who are the project beneficiaries. These contributions are sourced to cover the shortage in funds from its funding agencies. Beneficiary fees for FY13 also include hire charges of Rs0.4mn relating to letting out of an earth excavator on hire during the idle season. Expenses: Expenses totalled to Rs11.6mn in FY13 with programme expenses accounting for 88% of the total expenses indicating effective utilisation of funds. 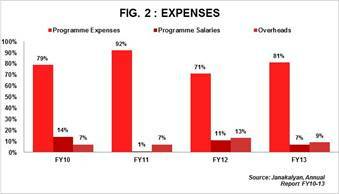 Overheads: Overheads in FY13 accounted for 9% of total expenses (Rs0.9mn in FY13 vs Rs1.3mn in FY12). The 4% decrease in overheads indicates effective management of funds. Fixed Assets: 55% (Rs7mn) of total assets is blocked in Fixed Assets. Increase of Rs4mn in FY13 is on account of project undertaken for construction of residential block and toilet block. Current Assets: There is sharp increase in current assets from Rs40,000 in FY12 to Rs5.4mn in FY13. This is on account of amount spent for the projects, but receivable from concerned sources. 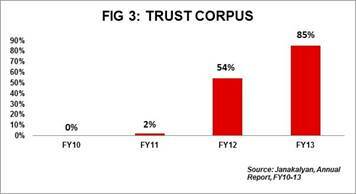 Trust Corpus: Assets purchased during the year to specifically form part of corpus are included therein. Corpus constitutes 85% (Rs8mn) of total funds in FY13. Loans: Janakalyan has constructed Maa Sarada College for the benefit of rural students. The loan of Rs3.5mn was procured to meet the shortfall in funds received for the construction. The proportion of loan in FY13 is 35% of total liabilities. Surplus: Janakalyan posted a surplus of Rs0.5mn in FY13 as against a deficit of Rs0.6mn in FY12. Funds utilisation ratio: It measures the ability of the NGO to effectively utilise the funds received. The organisation reported 100% utilisation of funds in FY13 indicating effective utilisation of funds. Self-sufficiency ratio: It measures the ability of the NGO to meet its expenses using its own funds (individual donations, sales, service charges and fees). The self-sufficiency ratio of 78% in FY13 can be attributed to the fact that 67% of the total of income in FY13 is through individual donations. However, on the basis of past three year’s financials it is observed that Janakalyan has relied on diverse sources of income. Dependency on individual donations: In FY13, dependency on individuals was more than 60%. However, Janakalyan has financial support of various agencies such as NABARD, GoK, GoI, UNICEF, GiveIndia, Tata Trusts etc. among others. Shortage of funds: Janakalyan has started a college (Maa Sarada) to provide education to rural children. Mobilising funds for this initiative is the biggest challenge as of now. Janakalyan has members from target communities (farmers, Heads of SHGs) on its Board.Every year a new board is constituted in the AGM. It has Byelaws and Procurement policies in place to govern the operation of routine activities. Service rules and Gender policies have been formulated to ensure equitable treatment to all its members irrespective of gender. Janakalyan also has an investment policy approved by board to invest and manage its funds. Janakalyan is accredited with Credibility Alliance for transparency and accountability. It is also a listed with GiveIndia.